married daughter of Chacko Panikkar, Karakkal, Thiruvalla.He had a son Thommi. the son of Chandapilla married from Vanchikkatte family. He had also a son Chacko. son of Chacko Padannamakkel married from Srampikkal family: He had three children while living in Kanjirappally. married from Ilanthur. He had the following children while living in Kanjirappally. married from Manjadi: He had five children while living in Kanjirappally. The listed below are his children. (e) Kunj Chacko married Mammy Kokkavayalil while living in Kanjirappally. (f) Abraham died at his youth, aged 28. Kunj Chacko, the second son of Avira Padannamakkel moved to a new house. This house was located near a palm (Pana) tree. Later, this house came to be known as Panackal. This classical house was with a shadow of panorama of a Palm tree. This famous Palm was a shelter of many flying birds and hundreds of bats. These bats were locked (bat is a flying mouse like animal) in Panackal palm tree during night and day times. It was children's one of the beautiful place for their meeting. They came to the ground to gather the dropped fruits from the bats on the tree. Gradually this house came to be known as Panackal among children and adults around neighborhood. There was a famous well for drinking water near Panackal house. People in neighborhood use to come to Panackal house to drink and bath from Panackal well. Thus Panackal well with crystalloid water became famous among children and adults. Kunj Chacko had many acres of land that inherited from his parents. He had a large estate of Rubber and Coconut plantations. Kunj Chacko married Mammy Kokkavayalil, Nedunkunnam. He was a prominent man in his community. This nice Dad was the Founder of 'Panackal house'. This great farmer never took rest in his life. He was actively participated in Church and Parish social works all through his life that paved the way for many clergies and nuns from his descendents and children of Panackal family. He was well versed for speaking and writing in different languages, including Tamil and Sanskrit. Also, He was a great spiritual guide for his children and grand children. Kunj Chacko died in 1962 at his home here in peace in Kanjirappally at the presence of a large family of his children and grand children. He had thirteen children while living in Kanjirappally. Mammy Kokkavayalil had to be a fine woman to bring up thirteen children in the 'depression years of Kanjirappally. 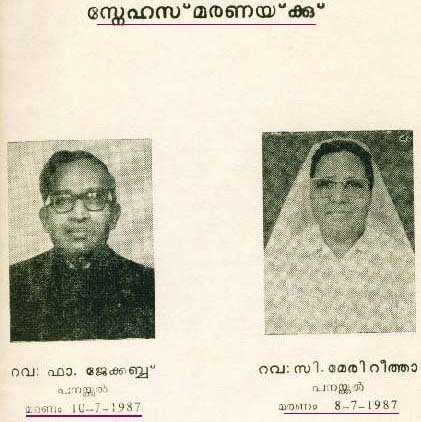 I. Kunjavira, P.C.Abraham (Avira Sir) married Mariyamma Padiyarayil, Manimala. II. Eleyamma Pennamma married Abraham Eartheyil, Kanjirappally. III. P.C. Chacko (Kuttappan) married Annamma Munjanattu. IV. Mathachan (P.C. Mathew) married Mariyamma, Nalukandathil. VI. Mariyamma (Kunjumariyamma) married Joseph Kiliruparampil. VIII. P.C. Thomas, Thommachan married Rosamma Kakkattil, Tidanade. IX. Thresiamma married Kora Kunjukutty, Iyamvayal, Chenganacheri. X. Oromma (Sr. Rose Infanta) Mother General-1946-1967. XI. Achamma married A.C.Mickal, Erthedethu-Manimala. XIII. Chechamma married Cheriyan Pappachan, Ilanjimattattu, Paika. I. P.C. Abraham (Kunjavira Sir) 1900-1984. Married Mariyamma, Padiyara while he was living in Kanjirappally. Avira Sir was a true straightforward man in his daily simple life. Avira Sir came from a very large family. If we have a lot of brothers and sisters then we have to learn two things. We have to learn to be tolerant and cooperative and we have to learn to stand up for ourself. His mother had to be a fine women to bring up thirteen children in the 'depression years of the 1920's and 1930's.He was an intellectual teacher lived among cultured classes during his life time. He was formerly a Head Master at St. Mary's School, Bharananganam. Avira Sir was a leader for many church organisations and actively involved to their charitable gift organisations in Kanjirappally. He died at his home in 1984 after his peaceful journey from here to the eternal world. This great couple had the following gifted children. died in 1987. She was a teacher in Madras and Kodaikkanal .She was Mother Superior general to her order of Convents.She was one of the greatest nuns of our times. They're all Mother Teresa, Sister Bertrille, and Sr. Ritha, Pennamma the most reverred givers of holy wisdom. They reflect to us the Singing Nun Maria from The Sound of Music. Fr. Jacob was a Benedictan father. Fr. Jacob Panackal was born in Kanjirappally on 30th August, 1928. After his studies he joined the Sylvester Benedictines of Kandy (Ceylon) and had his seminary studies in the papal seminary of Kandy. He was ordained priest on 6th August, 1957. He did his higher studies in the papal seminary of Kandy, Gregorian University of Rome and later he worded in many mission stations in the North, and for four years he was in Makkiad monastery itself teaching the students of philosophy. It was there that he learned privately homeopathy which was of great help for him later to work for the Hindus and Muslims of the area. He was then seen by his superiors to open their first house in Andhra Pradesh . Returning from there two years ago, he was appointed Vicar at Iritty where he worked sincerely and efficiently. He repaired and beautified the Church and re-modeled the residence of the priest. He organized catechism classes for children and was available in the confessional. He was soon known for his homeopathic treatment and spiritual treatment in the confessional which attracted many from even far away places. (iii ) Sr. Georgia (Claramma). was serving in Spain for a long time. married Omana daughter of P.D. Thomman, Ex.MLA. Appoochan also followed the same way where his father's footsteps to the path of his dignified teaching profession. He is a retired High school teacher and a foreign returned after his long dedicated teaching profession. He is one among the founding fathers to get to organise the Padannamakkel Family Association at its infant stage. This couple have four children, (a) Binoi, (b)Smita, (c)Bijoy and(d)Suma while living in Kanjirappally. Binoi is a B.A. degree holder. He lives with his parents. He is supervising his family propeties.Smitha Joseph is working as a plus teacher. She did her M.Sc and B.Ed. degrees. Bijoy Joseph is an Engineer at MIL Controls, Mala, Trichur. He did his B.Tech. degree with high honors. Suma is a School girl. married Prof. Joseph Mattam.They have two children, Deepa and Pradeep. Deepa married to Baby Mathew (engineer) son of Mathew Vaippana. married Joseph Pappachan Kollarakkal, Kothamangalam. They have two children Anjo and Meena while living in foreign countries. married Eapachan, Pulloliyil son of Stanislave, Pulloliyil . They teach at Manimala High school. They have four children, (a)Maalini (b)Yamuna ?Stanly and (d)Ebi while living in Kanjirappally. the second child of Kunjakko and Mammy married to Abraham (Aprem) son of Mathai Eartheyil. She had an ideal successful family like her father. This couple had eleven children while living in Kanjirappally. married Thresiamma Kanjirappally. He is a great farmer. died while he was very young. married Mathew Madukkakkuzhi. Mathew Madukkakkuzhi is a well known social worker. He is a Managing partner of Nirmala Trust, Kanjirappally. married Devesiachan, Idanade , Chenganacheri. They had four children while living in Chamanpathal, Vazhoor. born on 1934 and joined in the order of Holy Cross Sister. She is known as a Sr. Regina. She married to Thomas, Thoonkuzhi-Manipuzha. Thomas died in August 8, 1989.
born on Dec.15, 1940. Jose married Rosily Thuniyambral, Kadainikkade. They have three children while living in a foreign country. married Rosamma Vettikkalolikka, Ponkunnam. They have three children. married Eliyamma Varakukalayil, Ettithoppu. Elizebeth is their daughter. born on May 4, 1949 married Marykutty son of Joseph Kunnathupurayidathil, Chettuthodu. third son of Kunjakko and Mammy couple married Annamma daughter of Munjanattu Chacko (Pappan) and Mariyam while living in Panachepally, Kanjirappally. Chacko followed the footsteps of his father by his a simple life style. He was a hard worker for his family. They had six great children. son of Chacko and Annamma is a politician and a social worker. He was an active volunteer of Vimochana Samara in 1957. This revolt (Vimocana Samara) by the church and Hindu groups deprived out the Communist party of India from their office. Mr. Jacob was imprisoned in jail for his active work in revolution. He married Eleyamma son of late Mathai and Annamma, Vazhiplakkal. is another blessing man of Panakkal family. He is president and secretaries of various church organisations. Joseph Jacob married Valsamma daughter of late Thomas and Rosa, Inchiyani, Thannuveli. They have two blessing children, (a)Sebi and (b)Jemi . daughter of Chacko and Annamma married to Joseph Ousephechan son of late Joseph and Mariyam, Anjanattu- Kanjirappally. fourth son of Chacko and Annamma married Salimma daughter of Mathew and Mary Vaniyapurakkal. Anila, and Anish are their children. married to Baby son of Thomas and Sara Cherivupurayidam. Binoi, Phibi, Rosina are their children. daughter of Chacko and Annamma is a sister to the order of Ursaline Immaculate of Mary. She is a theology professer. fourth son of Kunjakko and Mammy married Mariyamma (Baby) daughter of Sabariar and Thresia, Nalukandathil- Veliyanadu . Their marriage was blessed by Fr. Abraham Puthuparampil in 1934. This family is settled at Malabar. They had four boys and four girls while living in Malabar. the son of Mathachan and Baby married Annamma, Chinnamma daughter of Vakkachan and Rosamma, Nediyakalayil- Ettumannoor. married to Simon Appachan son of Mathai Kunjappan and Mariyam. They had six children , 1. Mathew 2.George 3.Joseph Joshi 4.Dona Mariyam 5.Martin 6. Savio while living in Vailakkannoor, Kanoor. married Rosamma daughter of Dominic and Mariyamma, Maliakkal. Thomas Tomji and Dominic Domi are their children. married to Skariya Kochu son of Chandi and Thresia Chittanikkal. Raju Alexander and Manju Mathew are their children. is a member to the order of Poor Handmade of Jesus. married Rosily daughter of Vargese and Aleyamma, Kiliyanthara (Punnakkad) Trisur. Mary Joe is their child. the fifth son of Kunjakko and Mammy couples born on Jan 6, 1906, married Annamma Pennamma daughter of M.C. Mathai and Mariyamma Payyampally, Sanjayathil-Munjanattu, Kanjirappally. He was an executive officer to A.V. Thomas & Company. They had the following children while living in Kanjirappally. the first born daughter of Joseph Annamma married to Prof. George Sebastian, Devagiri College. Boby (Engineer)and Biby are their children. married to Jose son of Vargese and Annamma, Kamamathuruthel, Kaduthurithi. Ebi, Subi, Nobi are their children. married to George Kutty, Thodanal Nadakkal, Palai. They were teacheres in Nigeria. married Molykutty daughter of late Mammachan and Saramma, Kulangaramuriyil, Valakkayam. This couple have two children, Anu and Anju. married Rosamma Bsc.Bed daughter of late Thomas and Elyamma Nirmalagiri, Nellimala-Peruvanthanam. Joy is a transits employee and Rosamma is a high School teacher. Deepa and Elizebeth are their little girls. married to Jomi Thomas son of Thomas and Mary, Mulakukodyanikkal, Chakkampuzha. Kusumam is high school teacher and Joy works as a Sales Tax Officer. Asha and Abhilash are their children. Married Stella Kochurani daughter of M.V. George and Marykutty Mullankuzhi, Mammoottil. Annamma is their child. died in a fatal Bus accident to his destiny. He died in Feb.23, 1983 while he was a teen boy..!!! is the youngest daughter of Joseph and Annama. She is a teacher at Idukki district. the sixth daughter of Kunjakko and Mammy married to Joseph Kunju son of Joseph and Mariyam Kiliruparmpil. Joseph Kunju died on June, 1988. They have the following children. married to Kunjukutty Chempilavil. Mercy, Raju, Moli, Babu, Queens, Beena, and Royis are their children while living in Atimali. married Ammini daughter of Antony, Cherusseri, Nedunkunnam. Kunjachan died on July 1986. Jayamol, Jancy, Jasmin, Jomon, Kunjumon, and Deri are their children. married Annakuty, Kappiyankal, Mamkompu. Lauli, Lalu, Leena are their children while living at Chengalam. married to Appichan Kochuparampil. Lima, Tomi, Laisa, Benni, and Liji are their children while living in Chotti. married Achamma, Valumannel, Nariyampara. Roobi and Tomi are their children. married to Mathew Vadakkedethu, Athirampuzha. Rosilin, Bosco, Isac are their children while living in Athirampuzha. married Tessy Panathara. Tijo and Vinci are their children while living in Ponkunnam. married to Josekutty, Vellaplamuriyil. Jobin and Jophy are their children while living in Ludhiyana. married Marykutty Kanjamalayil, Anikkade. Santhosh and Saumya are their children while living in Kanjiramattam. married Moli, Madatani- Elampally. Esiyamma is their daughter while living in Ponkunnam. the seventh daughter of Kunjakko and Mammymarried to Devesiachan son of late Chacko Pappan and Mariyam. They had no children. Devesiachan died on 1989.
eight son of Kunjakko and Mammy married Rosa (Achamma) daughter of Kakkattil Varkey and Anna. They were the parents of the following children, one boy and four girls. married to Skariyachan son of Skariya and Eleykutty, Arumaannoor. They have the following children, Prathap Mon, Elsy Selsini, Prasanna, Thomas Mon and Kochurani while living in Arumaannur. is a Presentation Convent nun and a teacher. married to John(Appachan) son of Ulahannan and Elykutty Kothanallur, Thattankulangara. Jaysi (Jaya Mol) Jinsi, Jasmin (Aniyamma), Jobi, Josin are their children. married to Elsamma daughter of Mathai and Thresia Mundiyanikkal. They have three children, Rosmi, Rini and Thomas. married to Sebastian (Kunjumon) daughter of Varkey and Annamma, Vellichiyani, Kozhimala. They have three children, Deepa, Deepthi, and Divya while living in Kozhimalai. ninth daughter of Kunjakko and Mammy married to Kora Kunjukutty Iyyamvayalil while living in Chenganacheri. They have three children. died at the age of seven. is a mother of a convent. is working in abroad. He married Alis daughter of Appi Chennakkunnu Padikkal. Priya is their daughter while living in Karthikapuram, Malabar. daughter of Kunjakko and Mammy joined Convent to the Sisters of St. Joseph?s mission. She was a mother General, and Superior of Dharmagiri and pursued various hierarchy positions in her order. the eleventh daughter of Kunjakko and Mammy married to M.C. Mickle son of Cheriyan and Aley couples Earthedethu. She died at her home in 1987. They had the following children while living in Manimalai. married Rosamma daughter of Punnoose and Rosamma, Thodukail- Paika. was a nun. She died in October 1968.
is a nun in the order of Carmelite system. married Mariyamma daughter of Kuttiyachan and Rosamma. They have three children, Claris, Mikle, and Rosamma. married Valsamma daughter of Kunjachan and Mariyakutty, Edamannil-Manippuzha. They have two children , Claramma, and Mariyamma. married Rosamma. Bensappan is a bank officer. married Lauli daughter of Thomas and Annamma, Pulikkal-Ponkunnam. is ordained as a priest in 1989 from bishop Mathew Vattakuzhi. He is serving in the order of M.S.F.S. married to Jacob son of Mathachan, Vettukallamkuzzhiyil. the 12th child of Kunjakko and Mammy joined to the convent in 1953.
the youngest child of Kunjakko and Mammy married to Cheriyan Pappachan son of Skariya and Annamma, Vilakkumadam, Paika. They have the following children. is an Engineer in the Shipyard Industry of Cochin. He married Jansy daughter of U.V. John Uppottil, (the retired principal of NewMan college, Thodupuzha). married Valsamma daughter of Joseph and Leelamma, Mannoor- Alakkode. Priya and Arun are their children. Mr. James is a marketing manager in a Limited Company. married Prof. Jose Joseph Thekkemuriyal-Kanjiramattam. Deepthi and Deepak are their children. is an Engineer. He is working as a Managing Engineer in Rubber marketing. 1987 at New Delhi where he had gone two days ago to attend the Funeral of his eldest sister, a Religious. On Wednesday 8th July hearing about his sisters? death, he left for Bangalore together with Fr. Augustine, and said that if he were to die he should be buried wherever he dies. He felt he should ask for absolution from Fr. Aughustine. Did he have any pre-monition of his death? In New Delhi he could not complete the funeral service as he felt unwell. After the funeral he was well enough to go up to the airport to fetch his brother who arrived rather late for the funeral. Going back to the convent he found it difficult to breath, and he was taken to the hospital. He asked for a priest to receive the sacrament of the sick, and after receiving the viaticum, he said, "I am going to my fathers? home, my sister has already reached there", and then he became unconscious. He passed away after a short time, at 10.30 PM. On Friday 10th July. From New Delhi his body was taken to Kanjirappally, on Sunday morning, where his aged mother was waiting to see his body, and from there the body was brought to Makkiad (Wynad) by Monday morning. Because the body had already began to decay, the funeral fixed for he after-noon had to be conducted in the morning itself. For the funeral Mass concelebrated by the Bishop of Calicut together with the Prior of Makkiad monastery, Very Rev. Fr. Benedict O.S.B., and a good number of priests present, the Church was full with sisters and lay people a good number of whom had come from Iritty Parish. There were a good number of Muslim ,women, Hindus and Adivasis, most of them poor people, who had been cured of some sickness or other by Fr. Jacob. After the Mass, the funeral rites began officiated by Very Rev. Msgr. Moolankunnel, V.G., of Mananthvady and the rites were concluded by Bishop Jacob Thumkuzhy of Mananthvady. The body was interned in the cemetery of the monastery at 12.15 p.m. He loved pastoral work and was always ready to help any priest in need. Very often he used to turn in most unexpectedly at any priests? residence, with a big bag on his back and a broad smile on his face, and that used to be a welcome visit to many a priest who may be waiting to make his own confession or to get a substitute so that he could attend some other function. He used to be a blessing to Convents where there was no daily mass and he used to celebrate mass for them. He had a special charisma for talking pleasantly which made his company enjoyable. He was of a great service to many parishes and convents in our diocese. We remember him affectionately and gratefully, and we pray sincerely, ""eternal rest grant unto him, O Lord, and may perpetual light shine upon him. Amen""
"Come again to Padannamakkel Home"